Today was definitely what you would call a lazy day. I only left my scraproom to put a load of laundry in and get something to eat. I did manage to color some tilda's and make an easel card. I'm really happy with the way this one turned out. This card is for my daughter. I really hope she likes it. Well, off to play some more. Wow! How fancy. Love the scene you've set here. The coloring is fabulous too...Can't believe you're a novice. Great Job! Juliep your card is stunning! Your coloring is beautiful and I love the way you placed all the stamps to create such a wonderful scene! Your daughter should love it! Wow, this is absolutely stunning. what a beautiful scene, you did a great job. Your daughter would LOVE it. What a beautiful card. Who wouldn't love it. What an adorable card that I am sure your daughter is going to love! Awesome job with your coloring and I love the scene that you have created. your colouring is lovely. Your daughter will treasure it. Lovely layout. 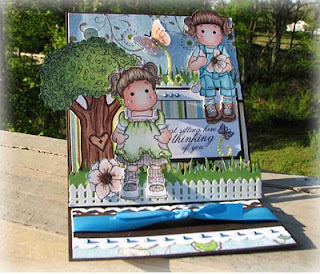 Oh my what an adorable card.. your scene is so gorgeous and creative. something out of a picture.. You did a beautiful job and your coloring is unique. I believe your daughter is simply going to fall in love with her card. great job...I love the card and the way you shot the photo.. Your daughter will love it! It's Gorgeous!! This is wonderful. It makes me feel like spring is here to stay!! Too cute, too fun and so very sweet! Love all the detail you've put into this, lots for the eyes to see! Beautiful! What a cute card ! You have done a great job with it. Julie ~ This is fabulous! I can't even imagine what greatness you will produce in the weeks ahead. Gorgeous card Julie!! WOW your scene is just gorgeous!! I love it ~ that is my big weak spot but this is just brilliant! Love the images that you used as well! What a terrific scene you've made on this easel card! So much fun detail to look at! Fantastic work Julie!! !